In the centre of Belgium, somewhat southeast of Brussels but north of Namur, lies a village called Liernu. 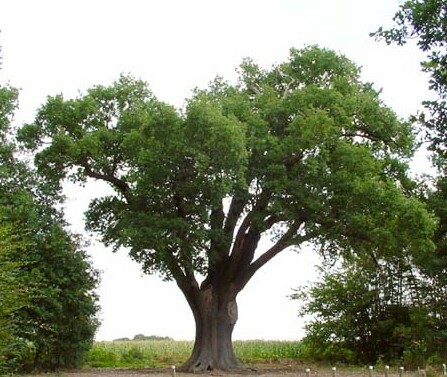 Along the main street and behind the church stands by far the biggest tree of Belgium: the famous Big Oak of Liernu (in french: Le gros ch�ne de Liernu). Local information says that the tree is over a 1000 years old, indeed it should date from the period short after Charlemagne but before the tenth century. Proof of this assertion seems not to be there. Nevertheless the oak is quite imposing: its enormous trunk has a girth at breastheight of 10,4 m (34 feet) and of 14,24m (nearly 47 feet) near the ground. The tree is in a very good condition, with a healthy crown, being 19m tall and 20m diameter and produces each year a lot of acorns. Its age seems to me to be in the same class as that of several oaks in Germany with a comparable size and outlook. So it should be some 600 to 700 years old. Near the end of the Middle Ages there should have been held a local court of justice in the shade of the oak. The trunk already is hollow for centuries: in 1838 the priest has placed a small statue of St. Anthony in the oak, wich was stolen in 1970. Since 1898 the tree is surrounded by a iron fence. In 1978 a Brotherhood of the Big Oak of Liernu was founded to patronize the tree. The Brotherhood has made an alliance with the Ancient Oaks of Allouville-Bellefosse in France and Ch�tillon in Switserland. Another oak with a certain fame stands in the Flemish part of Belgium, in the province of Limburg, near the village Lummen, wich can be found somewhat north-west of the town of Hasselt. It is sometimes called the Holy Oak but more often the Oak of a Thousand Years. 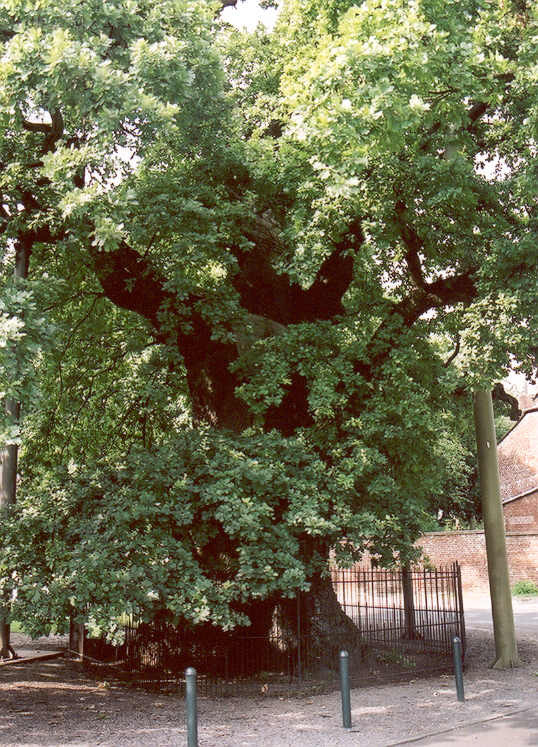 Local legends tell that under the oak was a court of justice in the Frankian Tradition since the times of Charlemagne (around the year 800) and that the oak should be even about 1700 years old. Probably the place has been a court of justice and probably as well there stood an oak in those old times, but the oak with its girth of only 21 feet (630 cm) doesn't look older than 400 or at most 500 years. So it could be that after the passing away of a former oak, a successor was planted or marked nearby. Rather sure is that in the 17th century under the oak of Lummen have been held witch-trials. Nowadays the oak is totally hollow and at the back side a large hole can be seen. Two big oaks in the Castle Park of Edingen / Enghien, Hainault. In the old castle park of Edingen / Enghien in Hainault, big trees can be seen. The park has mixed forests of ash, oak, beech, hornbeam, small leaved lime, sycamore maple, etc. on very good loam soils and several beautiful lanes and ornamental plantings of planes and other species along the Grand Canal. Outstanding among them are some beautiful large oaks. The oak "Duke Prosper" is rather difficult to be found in the southwestern part of the park, just east of th Grand Canal. 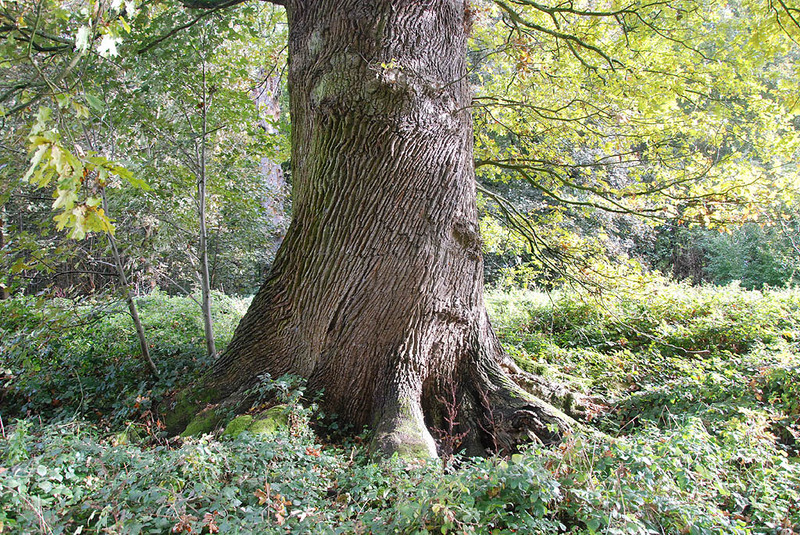 With a (lasermeasured) height of 31,5 m and cbh of 724 cm it is among the largest oaks of Belgium. Especially beautiful is the lower part of the trunk with the wide gripping roots. Its age can be estimated as not more than about 300 years. 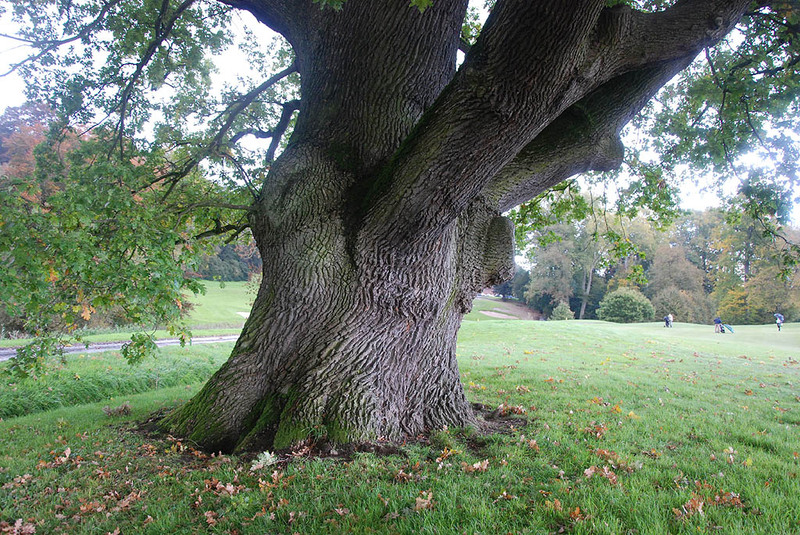 Another impressive oak is located 200 m to the southeast from the first, at the border of the golf course. 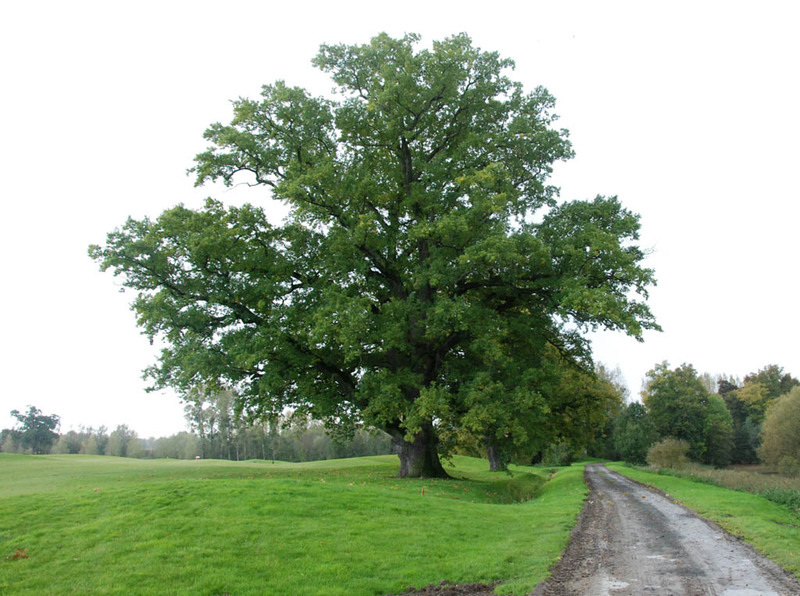 It is a typical open grown oak with a massive trunk, girth 756 cm, a height of 28,4 m and a 30 m spreading crown. The coulf course oak is looking very healthy and is probably between 250 and 300 years old.